The Tiny Titan (known as the Rally Romper in Europe and Oceania) is a small kart that appears in Mario Kart Wii. It is based on the Monster from Famicom Grand Prix II: 3D Hot Rally; this is further shown in its Japanese name, which is a direct reference to the game, and is in turn based on a Volkswagen Beetle open-top custom buggy. The Tiny Titan is unlocked by unlocking one expert staff ghost or by winning 50 races online. This kart has a 2-stroker twin cylinder engine placed in the back just like its real life counterpart (only the real one has a flat four stroke engine). Its bike counterpart is the Magikruiser. While it is the heaviest lightweight kart, at best, this kart's weight can surpass the weight of the Super Blooper and all of the medium bikes (except the Dolphin Dasher), but only if the babies ride on it (Baby Mario, Baby Luigi, Baby Peach, and Baby Daisy). 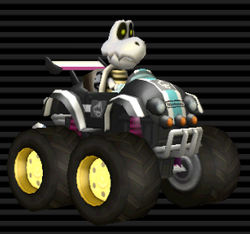 The Tiny Titan has the best off-road among all karts in the game, enabling it to take off-road shortcuts without losing too much speed. Its drift stat is rather low, however. The vehicle's other statistics are around average, and it is the heaviest small vehicle in the game. Its drift is tied with the Zip Zip and Spear. Its weight is also tied with the Zip Zip. Baby Mario – Red with white stripes, blue emblem, orange stripe through, tires are tinted cerulean. Baby Luigi – Green with white stripes, blue emblem, bright green stripe through. Baby Peach – Pink with white stripes, yellow emblem, light blue stripe through, tires are tinted green. Baby Daisy – Orange with white stripes, purple emblem, dark green stripe through, tires are tinted green. Toad – Blue with white stripes, green emblem, yellow stripe through, tires are tinted red. Toadette – Magenta with white stripes, pink emblem, orange stripe through, hub caps are tinted orange. Koopa Troopa – Swampy green with white stripes, green emblem, light green stripe through, hub caps are tinted bright green, tires are tinted green. Dry Bones – Black with white stripes, black emblem, light blue stripe through, tires are tinted brown-red. Male Mii – Turquoise with white stripes, yellow emblem, violet stripe through, tires are tinted turquoise. Female Mii – Yellow with white stripes, green emblem, orange stripe through, tires are tinted brown, hub caps are tinted brown. "The strengths of this ride are its Off-Road and Handling characteristics. Give this mini monster machine a try on tight tracks where you'll be spending time "in the rough," or as we call it with Tiny Titan, "the fun stuff." This page was last edited on March 8, 2019, at 16:33.